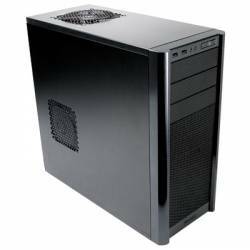 Description: Antec combines size, quality, features and low price to deliver the ultimate gaming case. The smallest of Antec’s “Hundred” series designed for the Do-It-Yourself gamer, it is equipped to deal with the increased heat output of high-performance systems as well as providing a flexible design to best suit your needs. Its overall matt-black finish shows that you – and your system – mean business. The front panel includes a pair of USB 2.0 inputs as well as jacks for a headphone and microphone. The front bezel is perforated for maximum air intake and it has a washable filter to reduce dust within the system. Inside, are a total of nine drive bays – six 3.5” internal HDD’s and a trio of 5.25” external drives. Seven expansion card slots let you load up on graphic and other options up to – and including – a full height ATX motherboard. A rear-mounted 120mm TriCool fan as well as a top-mounted 140mm TriCool fan – both with 3-speed switch control – draw air through the case. In addition, there's space for an additional pair of 120mm fans behind the front bezel to cool the HDD’s as well as the option to mount a third 120mm fan on the side of the case to cool the GPU. If you’d rather put your money into what goes inside the case rather than the case itself, the Antec Three Hundred is for you. Pros: Cheap, efficient, organized, basic. This product is by far one of the most efficient cases I've seen. We all know in reality its not the case that makes the machine, its whats inside of it. So when it comes to cases, one must think as getting the how it looks, not how it performs. The best thing is it sells for no more than 65 dollars. It comes with 4 fans, 2 intake at front, two outtake at back and top. Power supply is, logically, at the bottom. (I don't know why some PSU's where at the top in the old days). It has a filter for air in the front which performs magic in protecting your computer. Easy pull out cover for maintenance. Sturdy and very clean looking on the inside. The only bad thing, someone could argue, is that it doesen't look so good. However, for an additional 10 bucks (total of about 60$ on newegg.com) , you get the nice looking one with blue colored fans that make the rig loo pretty awesome. I use it for gaming and temperatures are very controlled. I have a GTX 580 in there (MSI) and it hols it very nicely. Very great case, bang for your buck.